Once upon a time there was a very messy boy. He did not brush his teeth. He did not like to wear clean clothes. He would wear the same clothes day after day if his mother would let him. He wore his muddy shoes into the house and did not wipe his feet. He left his books on the floor and his dirty socks on the table. He put his dirty fingers into the honey and licked the spoon that went into the sugar. He left his toys out where people would trip on them. He wrote on the walls with crayons. And he always spilled at the table! The boy's mother did her best to keep her son clean and tidy. She was the boy's Tidy Angel. Mother picked up after him. Mother her best to keep him clean. But one day, she said, "If you want to be dirty and untidy, go outside and live with your brother." "Do I have a brother?" the boy asked. I did not know I had a brother?" "You will find your brother outside in the garden," said his mother. "Go live with him." The messy little boy went out to the garden. He looked around. He did not see anyone that could be his brother. Soon, a squirrel came along. "Are you my brother," the messy little boy asked the squirrel. The squirrel looked at the messy boy. "No, No, No! I hope not," said the squirrel. My fur is neat. I do not have food down my front. My nest is nice and clean. I am not your brother. The squirrel ran off, and the messy child waited. Very soon, a wren flew and landed in the garden. "Are you my brother?" the messy boy asked the wren. "No, No, No! My goodness NO!" answered the wren. My feathers are clean. My nest is clean. Even my eggs are clean and tidy. I would not be your brother. You are a mess!" The messy boy waited and waited some more. Before long, a large cat came along. "Are you my brother?" asked the child. "No, No, No, a hundred times NO," said the cat. "Go look in the mirror, said the cat. You will see that I am not your brother. I have been sitting in the sun cleaning myself all morning. I can tell that you did not clean yourself. I would not want to be your brother! There is no one messy like you in my family." The cat put its tale in the air and walked away. Before long, a pig came trotting along. "Hello, brother," said the pig. "I am not your brother," said the messy little boy. "Yes, you are," said the pig. "We pigs recognize each other. I am not happy to be related to you. You are very messy. But, you are my brother. Come with me now. Let's have a nice roll in the lovely black mud." "I do not like to roll in the mud," said the little boy. "Tell that to the chickens and other farm animals," said the Pig Brother. "Look at your hands and face. Look at your wrinkled clothes and muddy shoes. You can eat some of my pig slop for supper." "I don't want to eat pig slop," said the boy. Then, he began to cry. Just then, the boy's mother came outside. "Everything in the house is nice and clean," she said. "If you come back inside, you must keep it that way. Do you want to come inside with me? Or do you want to go home with your Pig Brother?" she asked. The messy little boy looked up at his mother. She looked like a beautiful angel in the sparkling sunshine. "I want to come with you," he said. "I do not want to be a pig." Too bad for you," said the pig. "There will be more pig slop for me!" Then off he went. 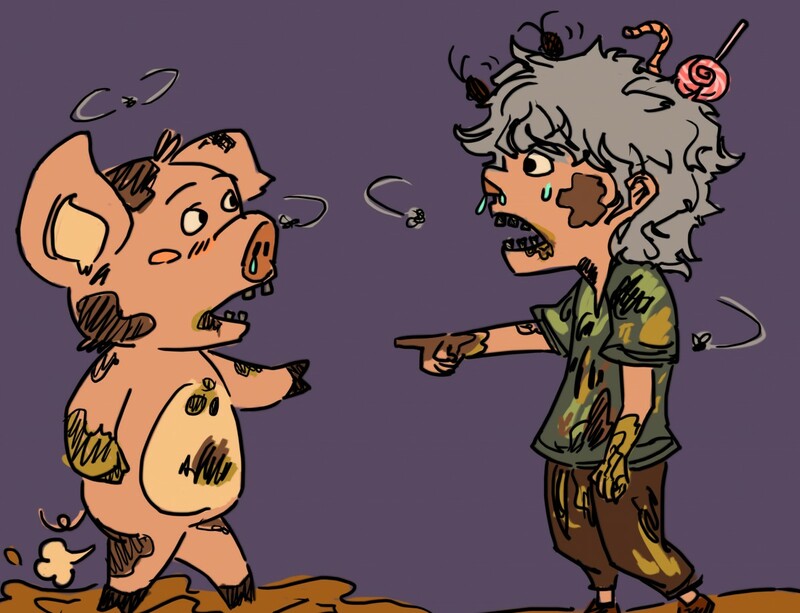 The little boy looked down at himself and again at the pig. He raised his arms for his mother to pick him up and said, "May I take a bath, please?"